As Roman daylight time was divided into a standard twelve hour day relative to the actual mount of daylight available each day, tasks activities could be planned not for set times, but as a proportion of each day. 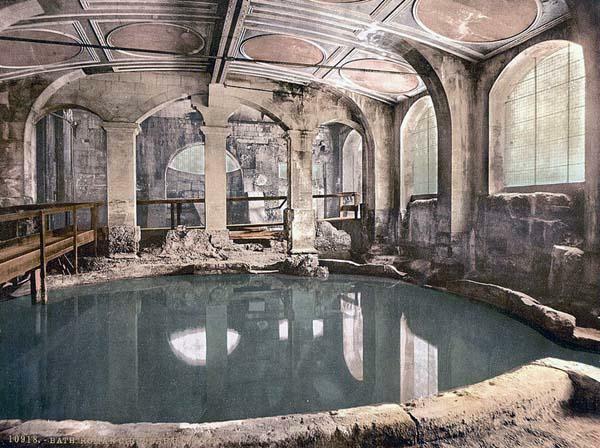 The main activity the Romans enjoyed was a visit to the Spa or Public Baths. There were more common in larger towns, with many having elaborate and well facilitated buildings. The best example of this is Bath, where the buildings have remained remarkably intact for the last 2000 years. The Baths were not just places to wash, they were also meeting places and sources of entertainment. Officials would meet in a relaxed atmosphere where they could build contacts to help their careers, make deals and generally spread the word about their presence. Although the baths were generally large places, it is reasonable to assume that the larger the town, the larger the bath. This is not so and many parts of Britain had relatively small privately run baths, such as Canterbury. Immediately after the exercise, they would get into the bath and thoroughly clean the body to clear out the impurities that had now risen to the surface. Along with this exercise there were many service persons who helped keep the body in trim. Masseurs, hairdressers, and even hair pluckers. were abundant. There were those who would display their strength, lifting heavy weights and objects to the delight of others. Strongmen would engage others in wrestling matches, with those around placing wagers on the outcome. There were also the traders who knew these places were meeting points for the well off and so descended in great quantities. They would supply fruits, 'snacks' of the day and drinks. 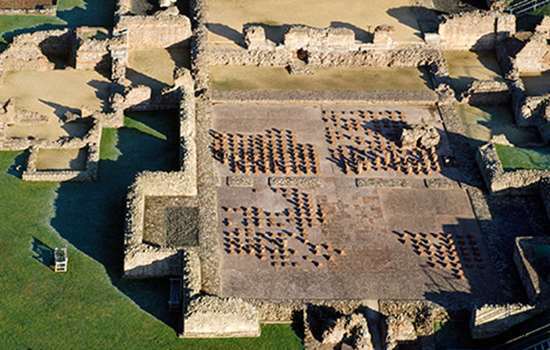 The food and drink sellers did not generally frequent the actual bathing area since the Romans did not like to consume anything directly before going into the bath for fear of cramps and indigestion. So they would stay in the open spaces and outer surrounds of the buildings. For the wealthier classes there was the dinner party. Again this was not just a pastime, it was a method of meeting and entertaining influential people who could help their careers. The party was given at the ninth hour of the day, so ensuring that the last quarter of the day was still light enough to hold the party. To understand this form of activity and dispel the myths surrounding it, we need to look at the dinner party in sections. It is a generally held conception that when the Romans threw a party, there was a great deal of gorging, and drinking. Although the dining rooms in houses were large, there was a lot of etiquette attached to the behaviour of the hosts and guests. When dining, it was considered bad manners to devour everything in sight and drink the place dry. The afternoon dinner was the main meal of the day and usually consisted of three courses, which were consumed at a leisurely pace with small talk and banter being exchanged between those involved. The wine served was also taken in moderation as it was considered an insult to over indulge in alcoholic drink . Even getting a bit merry, not to mention totally tanked, was considered impolite. It was normal practice to dilute the wine with water before it was served, and to offer it neat was looked upon as intemperate. The party did not consist of the food and drink alone, there was also entertainment during and after the meal. This entertainment, which was designed to delight both the eye and ear and to make the guests feel welcome and entertained with a host employing various methods to do this, with dancers, acrobats, jugglers being the most common form of after dinner entertainment. Musical performances often involved the flute, the water-organ, and the lyre, as well as choral works. Active forms of entertainment could include the aforementioned things like troupes of acrobats, dancing girls, gladiatorial fights, mime, pantomime, and even trained animals, such as lions and leopards. But, there were also more reserved options, such as recitations of poetry (particularly the new Roman epic, Virgil’s Aeneid), histories, and dramatic performances. Even the staff and slaves of the house were incorporated into the entertainment: singing cooks performed as they served guests, while young, attractive, and well-groomed male wine waiters provided an additional form of visual distraction. It cannot be ignored that the purpose of the dinner party was also in make the host known to the influential members of society. To do this, the whole house had to be decked out in items that would give the impression that the owner was a person of intellect and great culture. It was considered that an interest in the arts was the sign of potential. To achieve this, the house would have been fitted with elaborate mosaics, artwork and artefacts. To really make an impression the owner would commission a sculpture or painting that would be displayed in a prominent place in the house. Using the correct tableware went a long way to influencing the guests. The most wealthy hosts could afford silver plates and cutlery which would have been imported form the far eastern provinces of the empire. The less well off had items made from pewter, glass and clay. The wine jugs were made from the finest pottery that the host could afford. and would contain inscriptions such as 'long life' or 'give me neat wine'. The last being a dig at the Roman trait of diluting the wine. The Roman Banquet: A great page at the Met Museum's website that discusses the Roman banquet. Written by Katharine Raff. 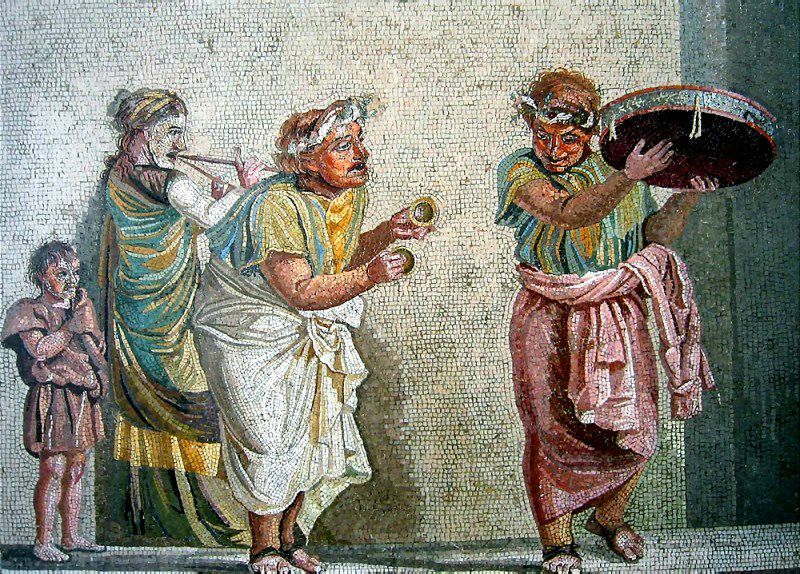 The Roman Dinner Party page on Outre monde, The Blog of Neel Burton: Another great article that discusses the Roman banquet and some of its details. The Roman Entertainment page at romae-vitam.com. More good information on this subject.